Autumn is fast approaching and I would like to suggest that you have all had a good Summer but if you did you were the fortunate ones in what has been the worst English Summer on record. No wonder more and more people decide to go abroad to get away. But if they did they will have missed the masses of events which took place locally and from articles in this edition of your local news, most if not all, were raving successes. Now all we can hope for as the dark nights arrive is that it is fine for everyone involved or attending the forthcoming Metheringham Fayre and Feast on 20 October. I am sure there is something for everyone in this issue although I must admit I have nearly had to be a dentist to extract articles from people this time around. I would just ask though, for people from Scopwick, Nocton and Martin to get into the spirit of sending me articles as we are trying hard to create a Community Magazine for All our villages. When you are asked to write a piece for a magazine and it has to be written far in advance of the readers actually reading it, and what you want to write of happened some time ago it can be a bit of a nightmare. Those of you who read the Parish Magazine will know that I tend to rabbit on a bit. I was the last one standing when it came to seeing who would organize the 'All Our Yesterdays' exhibition at St Peter's, Dunston. I have always, where possible, put "my two penn'th" in to help but never actually organized one. At the time it seemed like a good idea. Oh the naivety of it all!! Continue reading Review of All Our Yesterdays - Dunston. Nocton Village Trail has grown from strength to strength since its launch. With a new online presence and downloadable map www.noctonvillagetrail.com it is now set to attract even more visitors. The trail was launched in May 2007 with a village walk consisting of 100 residents and special guest the Rt. Hon. Douglas Hogg MP. After taking five years to develop, this was a massive result following all the hard work and dedication from both residents and ArtsNK. Continue reading Nocton Village Trail. 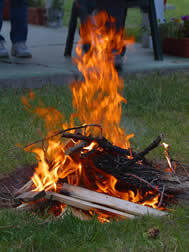 Can we be the only residents in Metheringham who are sick to death of garden bonfires on lovely days? It is the same year in year out! As soon as we have a lovely sunny day when you can throw open the windows and doors, hang the washing on the line and sit outside for lunch, some selfish unthinking person, to put it politely, lights a stinking garden bonfire, which means, closing all doors and windows, bringing in the washing and sitting inside until the said bonfire has stopped smoking. May we remind these people that lighting bonfires when there is a breeze is against the law. We are totally fed up with having our bungalow filled with the smell, often acrid, and not being able to have our bedroom window open during the night when we are lucky enough to have the weather to do so. To all bonfire lighters. Please think of your neighbours and neighbourhood and stop being so selfish. Sustainable transport charity Sustrans plans to join up the dots between communities and amenities, with its groundbreaking Connect2 programme to develop new walking and cycling routes around the UK - and the nationwide programme of seventy nine projects includes two projects in Lincolnshire, a route over the A17 at Holdingham and Sleaford and a green link between Carlton-le Moorland and Bassingham. Continue reading Connect2 : Bridging Transport Gaps. 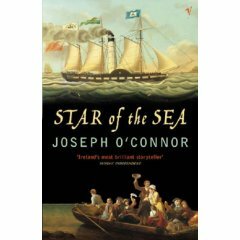 This book is set in 1847 and tells the story of the passengers who are emigrating to America on the ship The Star of the Sea in the hope of finding a better life for themselves after the potato famine in Ireland. Grantley Dixon, an American journalist and one of the first class passengers, tells the tale and it is written as though compiled from a variety of historical documents including diaries, letters and eyewitness accounts. The lives of both first class and steerage travellers are interwoven and the story is about why they are on the Star, where they have come from and why they are going to America. Lord Merridith, a bankrupt aristocrat, has had to leave his home in Ireland and is travelling with his wife, young sons and their nurse Mary Duane. The book is described as a murder mystery with Pius Mulvey "The Ghost" having been detailed to murder Lord Merridith. His Recollections and Reminiscences of Metheringham; pre and post WW2. Reg Rush was born in Metheringham around 86 years ago and in the last issue we wrote about his grand-father Amos Cooling. Reg himself has had a more than interesting life and leaving the village as a sixteen year old he went on to attend the Midland Agricultural College in Leicestershire. He was never to return to live in the village as he became a member of the crack 30 Commando Unit in WW2. This Assault Unit was the brain child of Lord Mountbatten and Commander Ian Fleming (author of the James Bond books) and until recently their actions in the war were top secret. An interesting website www.30AU.co.uk shows Reg as a 20 year with the unit. Another member of this unit was Charles Wheeler who later became a journalist with the BBC. Reg later became the Secretary of the Royal Marine Command Veterans’ Association and now lives a busy life in Wells next the Sea, Norfolk. Below is his "Recollections and Reminiscences of Metheringham. Continue reading Reg Rush of Norfolk - Reminiscences. 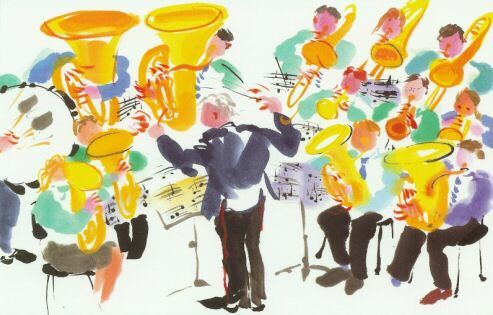 JOIN US AND CONTRIBUTE TO THE SUCCESS OF YOUR LOCAL BRASS BAND. So whether you already play, or would like to learn, come along and join us. We will provide tuition, loan of an instrument and music; and the subs are only £12/qtr. We play at fetes and concerts, and players from the Band had great results at the Lincoln Music & Drama Festival earlier this year. We also need percussionists, so come along and sign-up! Need a helping hand onto the Property ladder? are being developed in North Kesteven, then shared ownership could be the solution for you. Further details are contained in this leaflet from North Kesteven District Council. This page is a archive of recent entries in the 28. Autumn 2007 category. 27. Summer 2007 is the previous category. 29. Winter 2007 is the next category.